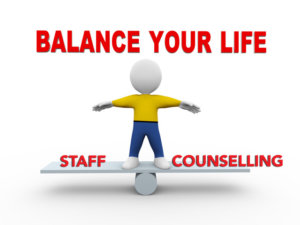 Weekly counselling sessions of fifty minutes, over a period of at least six to eight weeks. The sessions are confidential, person-centred and tailored to the individual’s needs, providing a safe, therapeutic space where the staff member is facilitated to express and explore their feelings, thoughts and experiences. This work focuses on strengths in order to build confidence, resilience and self-esteem. Coping mechanisms are developed through methods such as mindfulness, relaxation techniques and self-reflection. Schools can be a stressful environment to work in. Sometimes there will be situations that arise that can have a negative impact on staff and staff will benefit from having an impartial place to “offload”, debrief and consider coping strategies. Consultation sessions can be set up at short notice during or immediately following a crisis, according to need. Services for Schools can run workshops on a range of wellbeing-related subjects. Please contact us to discuss your requirements. How can Counselling and Support benefit your school?